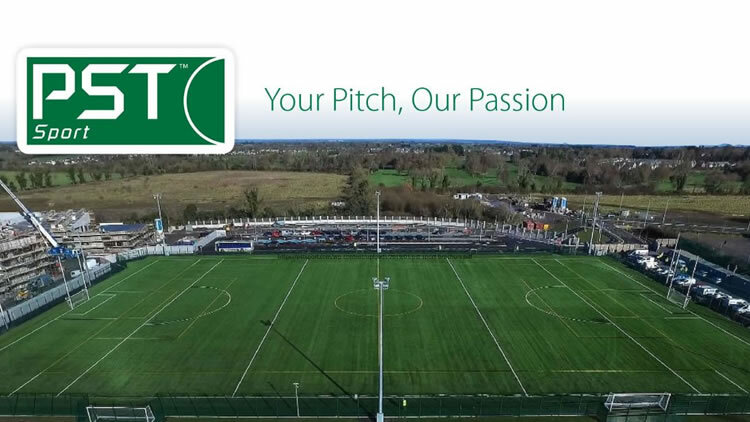 PST Sport is a Design & Build Contractor specialising in the construction of world-class artificial grass GAA pitches. We understand the key role played by synthetic turf pitches in the development of the GAA today. GAA clubs of all sizes are now incorporating artificial pitches into their current and future developments with the demand for high quality facilities increasing as training and preparation for GAA, at all levels, continues to grow and evolve. Our high performing synthetic turf system has been developed with input from Ireland’s leading GAA athletes. It has been certified by the world’s leading sports laboratory showing it meets the standards set down by the GAA for artificial grass pitches. This means your club members of all levels, from underage to senior, can train regardless of the weather or ground conditions. PST Sport is heavily integrated into the GAA with former Kerry All-Ireland winner, Kieran Donaghy heading up our Business Development Team. WATCH as PST Sport’s Kieran Donaghy talks to TG4 Presenter & former GAA star Dara Ó’Cinnéide about the key role played by artificial grass pitches in the development of GAA today. In January 2019, PST Sport completed the installation of a world-class 12,000 sq/m 3G GAA pitch at St Vincent’s GAA in Dublin. The project included full groundworks, carpet & shock pad to meet GAA specification. Our ‘SUPERB 60’ carpet installed here is the very latest in synthetic turf technology. Below ground works are equally as important – get this stage right and maximise the lifespan of the pitch. Read more. With in-house expertise across each facet of pitch construction including groundworks and drainage, fencing, sports netting and floodlight systems, we can provide a tailor-made solution unlike any other available in the market. We will look at your club’s needs and customise a pitch design around this, ensuring maximum value for money and return on investment. In 2016 we installed a full-size GAA, FIFA & World Rugby Approved pitch at Le Chéile Secondary School in Tyrrelstown, Co. Dublin for Fingal County Council. 14,400 sq/m 3G pitch with 60mm artificial grass carpet and shock pad at Derry GAA’s Owenbeg Centre of Excellence. 3,000 sq/m artificial grass pitch with 60mm synthetic turf carpet and shock pad for Boherlahan Dualla GAA in Co. Tipperary. Ancillary works included fencing, floodlights, 2G 60mm carpet for the area outside the hurling wall & 24mm fibrillated carpet for pathways. 1,250 sq/m 3G pitch with 60mm carpet and shock pad at Kilrossanty GAA, Co. Waterford. The project included groundworks & drainage, kerbing, fencing, netting & floodlights. 1,200 sq/m indoor training pitch including base works at Broadford GAA, Co. Kildare. 2,200 sq/m artificial grass pitch including base works, fencing, netting, and floodlights for Doheny GAA, Co. Cork.